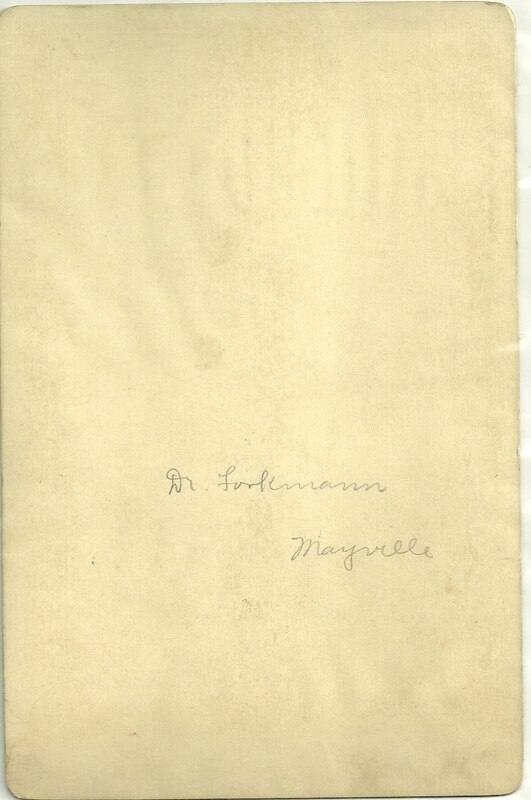 Cabinet photograph of Dr. Forkmann, Mayville, Wisconson, who I believe is Dr. Hans Heinrich Forkmann, who emigrated from Wuerzburg, Bavaria, Germany, to the United States in 1891 and became a US citizen in 1896. In 1893, he married Ottilie, who was born about 1870 in Wisconsin. I haven't been able to find out anything about the parents of Dr. Forkmann or his wife Ottilie, but I found a reference to him in the Wisconsin Session Laws of 1915, where he was honored on the occasion of his death. It was noted that he received a law degree from the University of Munich, was a teacher of Latin and Greek at Mayville and eventually became editor of the Dodge County Banner; most importantly, he was the well-respected spokesman for the German community in Wisconsin. Relating to the death of Dr. Hans Heinrich Porkmann. Whereas, in his beloved Mayville where he had resided and worked for the last twenty-five years, Dr. Hans Heinrich Forkmann died on Sunday hist, the eighth of August, 1915. Removed suddenly and all too early from his sphere of work that had become so dear to him. he who was ever full of joy and energy now lies upon "the lone couch of his everlasting sleep". His devoted wife is bowed down in grief and with her all Mayville mourns the loss of its most striking figure and one of its most beloved and influential citizens. This profound sense of loss is not confined, however, to the little city of Mayville. In the entire state of Wisconsin, and far beyond its boundaries, wherever in this great land of ours there are German singers and turners, American patriots and good and true men, sorrow will fill many a heart at the thought that Hans Porkmann is no more. Born on April 5, 18G8, in historic Wuerzburg in Bavaria, he enjoyed all the advantages of a broad and thorough education in the gymnasium and later in the university of his native city, receiving finally, in 1890, the degree of Doctor of Law at the famous University of Munich. The following year he landed on the shores of our country and soon found his way to Mayville where for over fifteen years he was active in the schools of that city as a teacher of Latin and German of unusual breadth and depth of training. In 1907 he assumed the editorial control of the Dodge County Banner and by dint of hard and enthusiastic labor soon raised this local paper to a position of influence among an ever widening circle of readers. Though free from political aspirations for himself, he wielded influence, by pen and speech, as an independent democrat. He was a staunch and enthusiastic supporter of President Woodrow Wilson. Resolved, That an engrossed copy of these resolutions, attested by the presiding officers and chief clerks of the senate and assembly, be transmitted to Mrs. Forkmann, widow of the deceased, at the city of Mayville. If you have any information on Dr. Forkmann or his wife Ottilie, I would very much appreciate hearing from you. Thanks for stopping by! Update: I've heard from a helpful reader that Ottilie was born in September 1870 in Williamstown, Wisconsin, the daughter of Henry Ruedebusch. Ottilie had an older sister named Albertine, who perhaps never married. Ottilie and Albertine are living together in the 1920 and 1930 Censuses of Mayville. 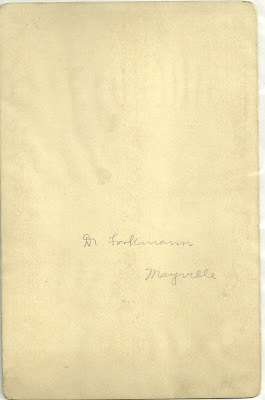 Ottilie's husband Hans Heinrich Forkmann had died in 1915. 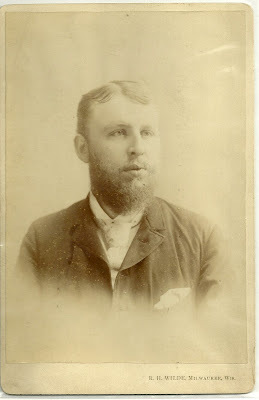 Ottilie's father Henry was born in 1832 in Germany and came to the US in 1860. I haven't figured out his wife's name yet, and it's tricky, because there was apparently another Henry Ruedebusch born about the same time and also living in Wisconsin.